We made it to May! 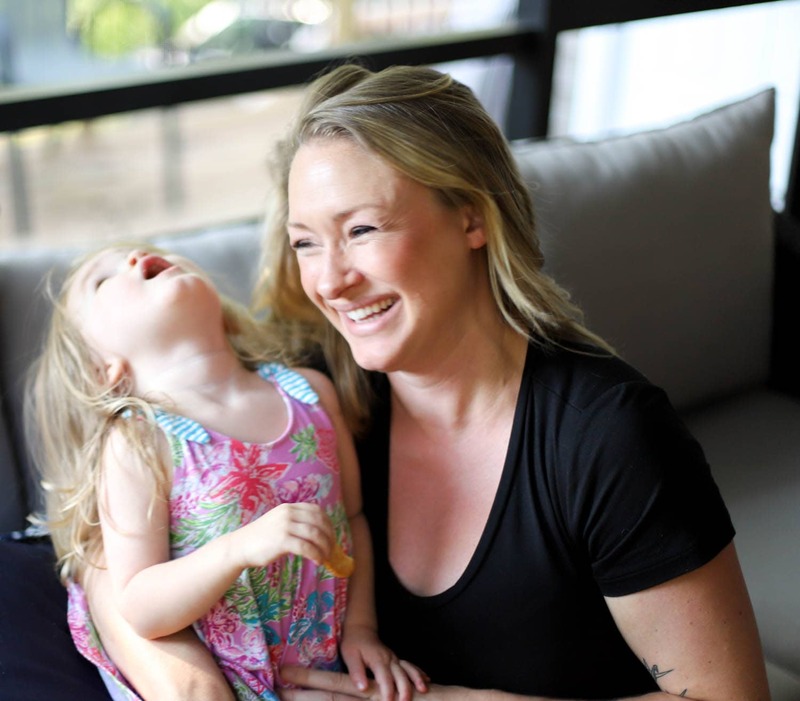 And now it’s only a few more days until Cinco de Mayo and right after that it’s Memorial Day and then vacations and 4th of July and two of my besties are having babies and HOW IS IT TIME TO START PLANNING THANKSGIVING. But really. Does one ever mature enough to accept that they are old enough to experience the passing of time at a faster rate or is it just….too fast all the time until I die? Let’s not think too hard about that. Tacos! 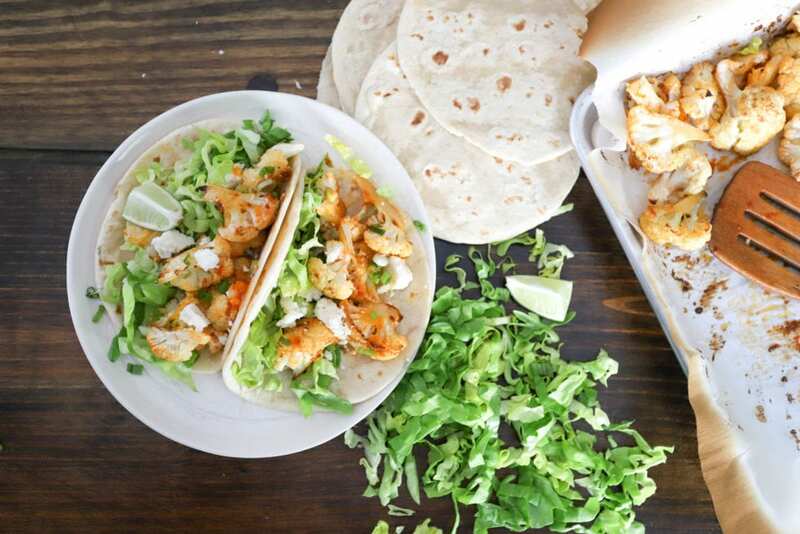 Light, healthy, vegetarian tacos, to be exact. I’m a huge fan of Buffalo-flavored anything, and have been seeing cauliflower based dishes all over the internet. I love cauliflower in general, and the idea of it as a meat substitute appealed to me so much – the texture and chew from it plus extra vitamins and low fat/calories YES PLEASE. So we are having Buffalo Cauliflower Tacos. I didn’t do any kind of breading or frying for the sake of our bellies and the smell of our houses. Instead, the cauliflower gets roasted until blackened at the edges, then a super quick buffalo sauce goes all over everything. 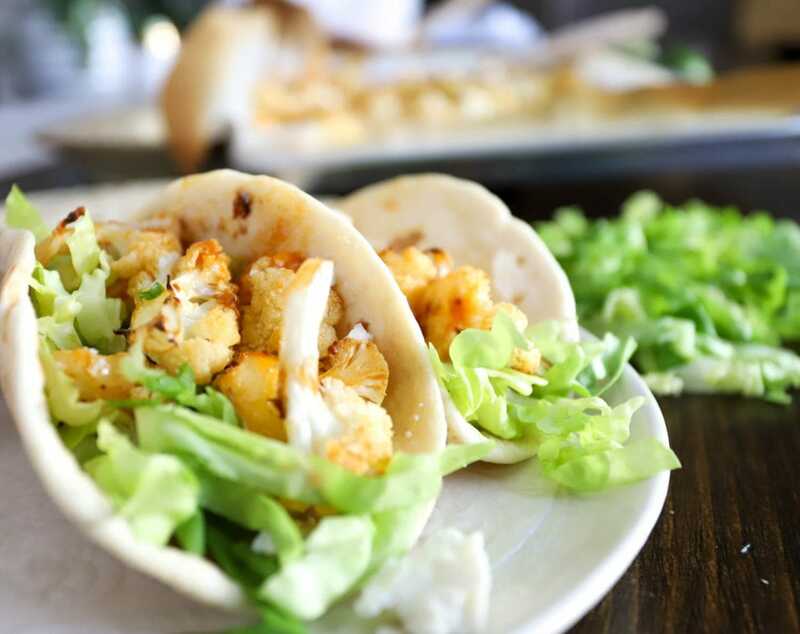 You can dress your tacos up however you’d like, but I’m a huge fan of lettuce (cabbage can get kind of crunchy and overpower the soft cauliflower), queso fresco, green onion, and lime. 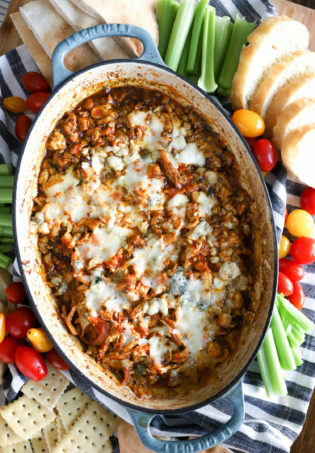 I ditched the blue cheese and celery for this version because I think it’s kind of obvious BUT those flavors go great with buffalo, so have at it if you have those ingredients on hand! 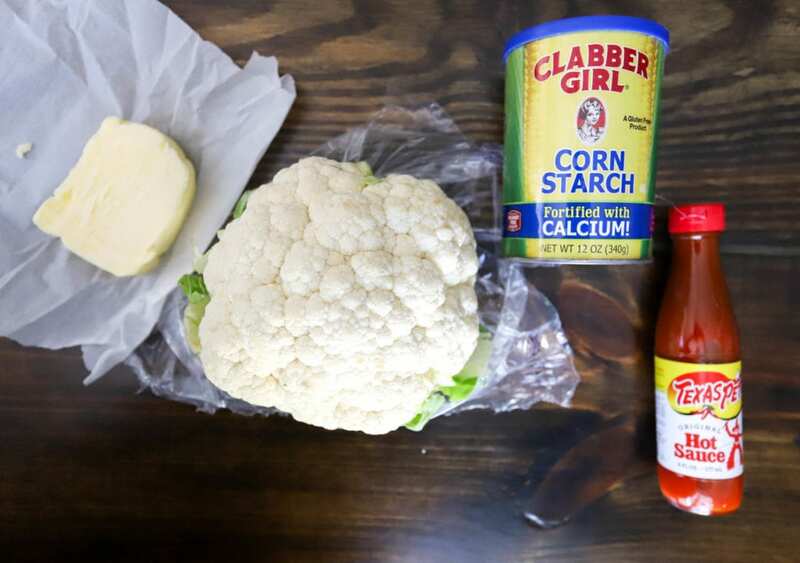 The cauliflower itself is stupid-easy – I added some cornstarch to the sauce to thicken it and help it coat the cauliflower a bit, but other than that the method is super simple. It’s just cauliflower, then butter, hot sauce, and cornstarch for the sauce. 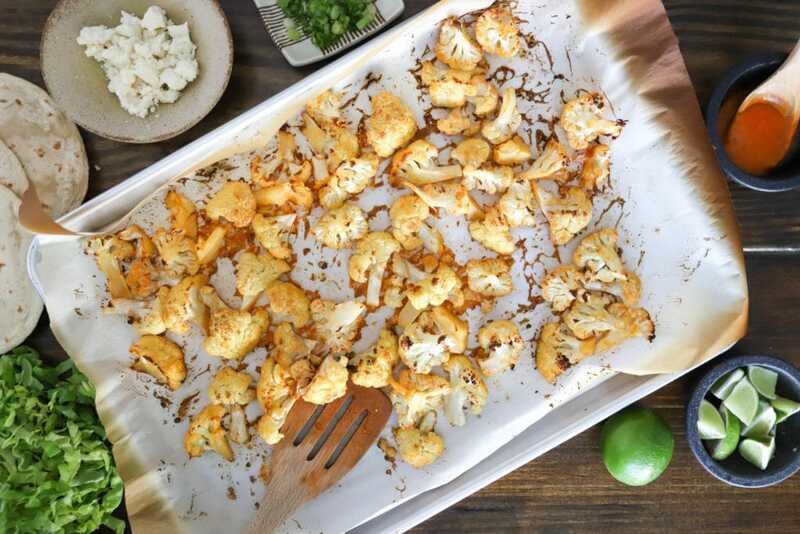 Start by preheating the oven to 450F and breaking the cauliflower into bite-sized pieces. 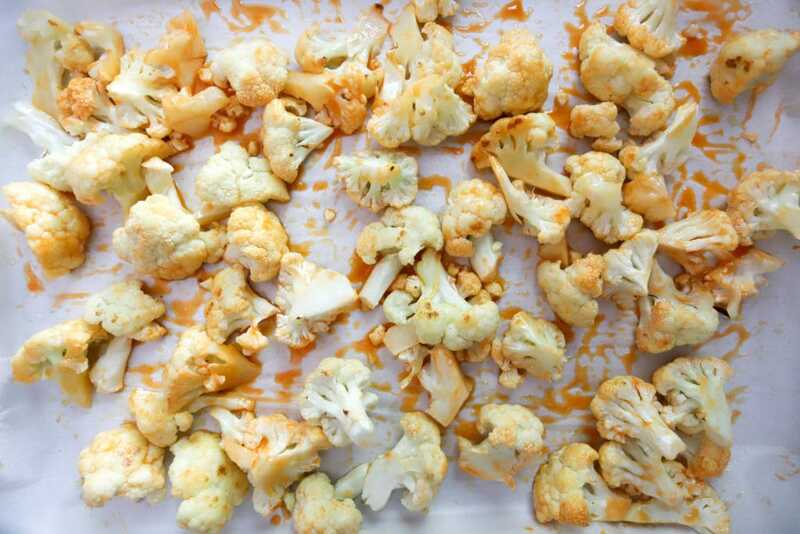 Arrange them on a large baking sheet, then drizzle the cauliflower with some oil and sprinkle it with salt. Stick it in the oven for 15 minutes. During the first round of baking, make the buffalo sauce. 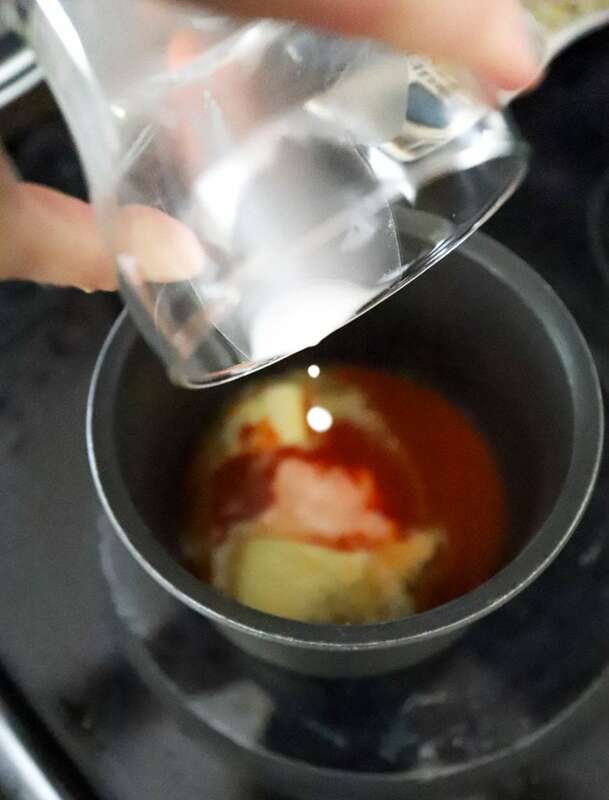 Add the hot sauce and butter to a little pan, and mix the cornstarch with some water until it dissolves, then pour that mixture into the pan. Bring the buffalo sauce to a simmer over medium heat and taste it; add more hot sauce if you’d like or water if it is too thick to pour easily. Turn the heat off and let the buffalo sauce sit until you’re ready to use it. When the cauliflower has roasted for 15 minutes, remove it from the oven and pour half the buffalo sauce over the cauliflower. 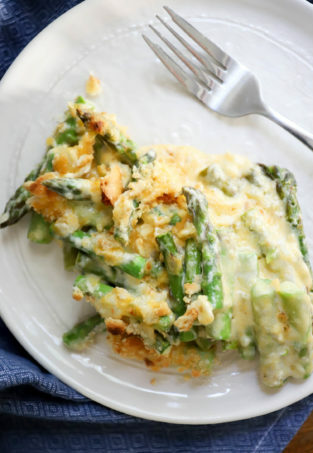 Toss the cauliflower in the sauce and return it to the oven in one layer for 15-20 minutes more until the cauliflower is dark at the edges and cooked through. The buffalo sauce will stick to the cauliflower and create a great coating and JUST YES. I use this roasting time to gather up any taco toppings/fillings I’m going to use. Boom. That’s it! As long as you make the sauce during the first roasting time and prep the tacos during the second roasting time, this meal is ready to go in 45 minutes or less. Maybe it’ll take longer if you make a pitcher of margaritas to sip on while you wait, but that wouldn’t be a bad thing at all. I love this cauliflower because it’s a perfect vegetarian taco filling that isn’t pretending to be meat. It’s straight veg, living its best life, doused in hot sauce and butter just like your best life should be. You could definitely do this same method with enchilada sauce or even salsa for more of a Mexican flare, but you WOULD lose the doused-with-butter component of the dish, so make your own choices there. Handheld salad is what I’m thinking we call these for even more healthy appeal. It’s true! Preheat the oven to 450F. 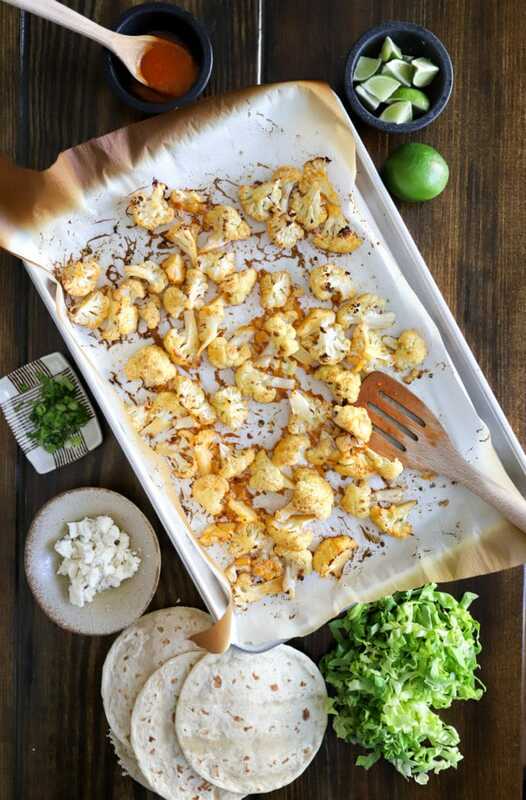 Arrange the cauliflower on a baking sheet and toss with the olive oil and salt. 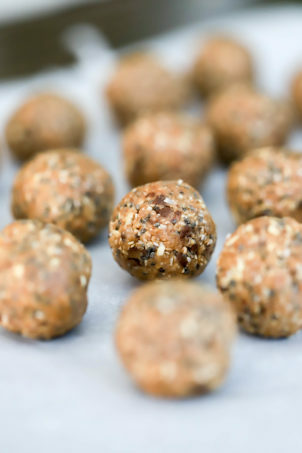 Spread into a single layer and roast for 15 minutes. Meanwhile, make the buffalo sauce. Add the butter and hot sauce to a small pan over medium heat. Stir the cornstarch into one tablespoon of water until dissolved, then pour the mixture into the pan. 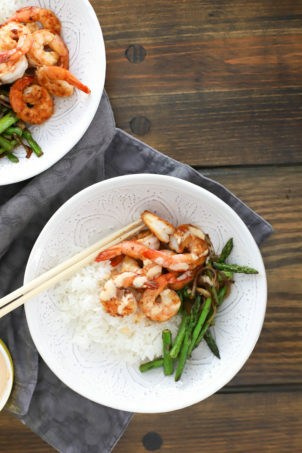 Stir the buffalo sauce until the ingredients are combined and the sauce simmers. Taste, and add more hot sauce if you'd like, or more water 1 tablespoon at a time if the sauce thickens too much. Turn the heat off the sauce. 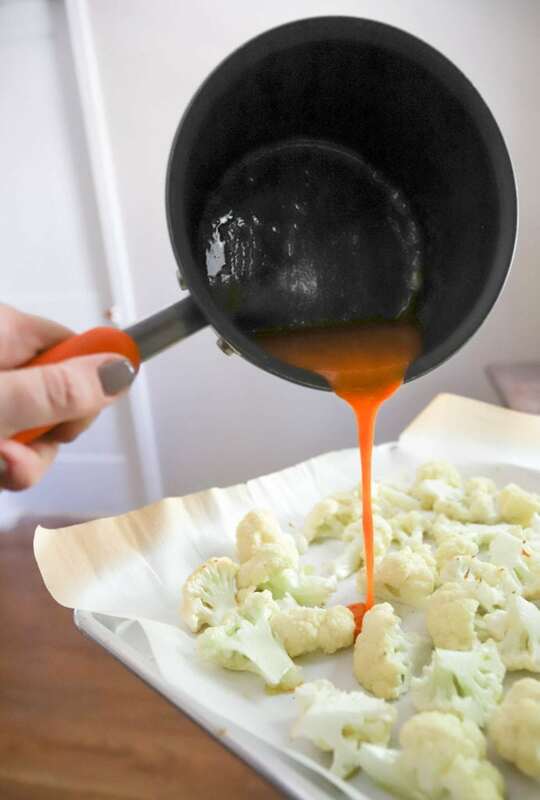 When the cauliflower has been roasting for 15 minutes, remove it from the oven and pour half of the buffalo sauce over the entire pan. 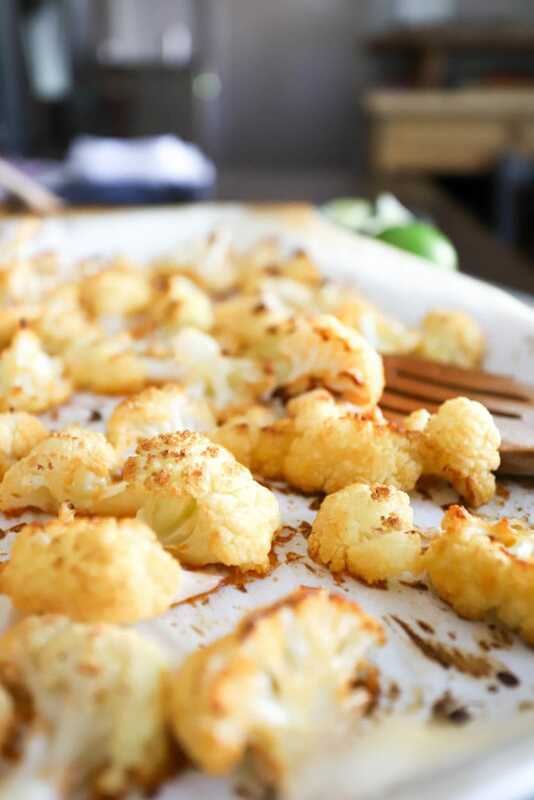 Toss the cauliflower in the sauce to coat evenly, then spread in one layer again and return to the oven for 15-20 minutes more until the cauliflower is dark and crispy at the edges. While the cauliflower is finishing I like to prep the rest of the ingredients for tacos. 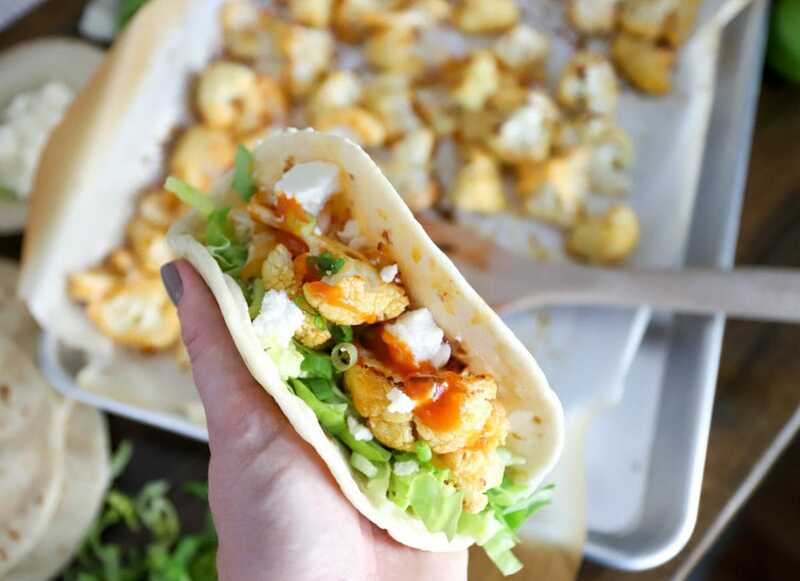 When the cauliflower is roasted, load it into tacos and serve with the extra buffalo sauce for drizzling. Enjoy!